Make Some Manuka Honey Sriracha Shrimp! When it comes to good seafood, there are fewer things better than cooked shrimp whether it’s served with cocktail sauce or cooked on top of a white sauce pizza. For those who have dinner ideas in mind that are just shy of complete, see if you can add these Manuka honey sriracha shrimp to the meal! 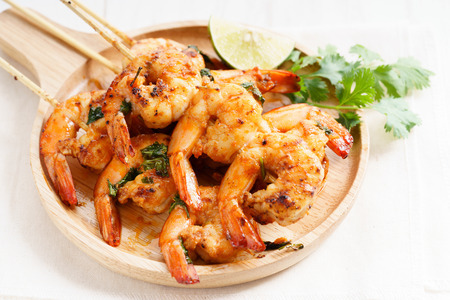 Combining spiciness and sweetness as well as the zestiness of lime, this blending of flavors perfectly complements fresh shrimp, with the grill adding slight hints of smokiness. This recipe is one even the kids will love, so let’s get started on those Manuka honey sriracha shrimp! Note: This recipe requires about four or five wooden skewers. Soak them in water for about 20 minutes before using, as this will keep the skewers from burning while on the grill. Before you begin, heat your grill up to medium-hot heat, which should be about 400 degrees Fahrenheit. Rub your grill grates down with some olive oil. In a smaller pan on medium-high heat, melt down the butter. Once it’s melted, throw in your garlic and fresh ginger, stirring until fragrant, which should be around 1 minute. Then, add your ground cloves and smoked paprika, letting the blended ingredients simmer for about 4 or 5 minutes. Remove the pan from the heat before stirring in the Manuka honey, lime juice, and sriracha. Now, thread your shrimp onto about four or five wooden skewers before placing them on the grill. Cook your shrimp for about 2 or 3 minutes until they easily release from the grill and then flip the skewers to grill the other side of the shrimp for the same amount of time. Brush your Manuka honey/sriracha glaze onto both sides of your shrimp and then grill both sides for about another minute. Remove your shrimp from the grill before glazing them one more time. If you want to, you can sprinkle the shrimp with cilantro and serve with a few lime wedges. You should have about four servings’ worth of shrimp. Now, enjoy your Manuka honey sriracha shrimp!